Election season is in full swing, and Congress is in recess, which means that instead of hanging out in D.C., most Senators and Representatives are in their home states, listening to voters. Agriculture hasn’t gotten much discussion at the national level, which makes it even more critical that candidates hear from farmers. Young farmers are important constituents, and candidates need to understand that agricultural issues matter. Many candidates and elected officials don’t know very much about farming and even less about growing and marketing methods that many young farmers care about, like organic farming and CSAs. When you take the time to educate policymakers, you are doing them a favor. You’re also helping to inform policy that could impact farmers nationwide. But before we talk about how to engage, you are registered to vote, right? If you aren’t sure, you can register here. Attend a town hall or candidate forum. While there is no universal format for town halls or forums, anyone who attends can ask questions or make a statement. Candidates use these events to share their beliefs and get feedback on the issues and positions that matter to constituents. Attending one of these events gives you the opportunity to talk about farming and publicly ask the candidate for support. Ask a question at a local debate. 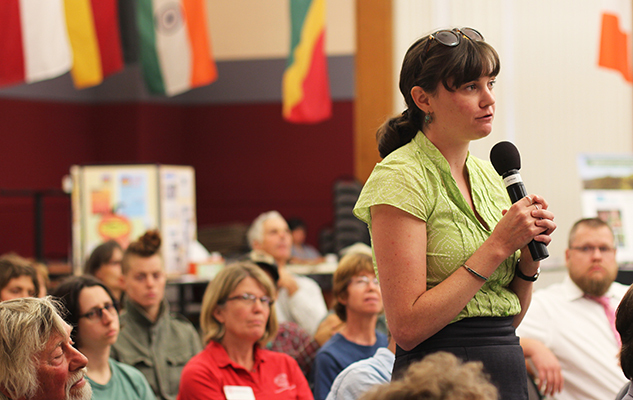 Debates often provide the opportunity for the audience to ask questions. By attending and asking about agriculture, you can challenge both candidates to take on the issue. Get a group of local farmers together to request an on-farm meeting with the candidate. What better way is there to show the importance of farming than to get the candidate out onto a local farm! If you get a couple local farmers together, you can show your impact on the local community and demonstrate your challenges and successes first-hand. Rep. Yolo at Swallowtail Farm in Florida. Engage the candidates on social media. If you only have a few minutes or cannot make it to an event, you can still reach out to a candidate online. Campaign staffers are carefully watching Facebook, Twitter, and Instagram. If you share a position with the candidate online, the staff will take note. Bring your friends into the conversation. Candidates will pay attention to the positions they hear the loudest and most often. So bring other constituents with you to amplify your impact, either online or in person. One last reminder: We all have personal politics and preferred candidates. However, elected officials are charged with representing all their constituents, not just the ones who voted for them. You do not need to agree with your officials’ politics in order to invite them out to the farm, attend an event, or make the case for them to support good agriculture policy. Farmers need champions from both sides of the aisle, and lawmakers need your help understanding the issues!